This was a recent find of mine, sadly now sold. This cute felt toy has a rare tiny blank button. I had not seen him before, normally you just get the chicken head cosy. A tip for spotting a Steiff toy, they are really the only people who put a circle of red felt behind the eye. This item appears in the Steiff Sortiment as just a black and white photo from an original catalogue, so it must be fairly rare. 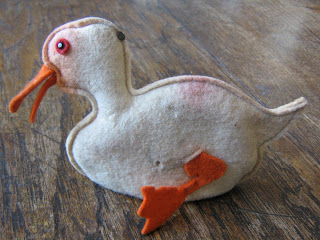 Steiff's felt toys are amongst my favourite, they made every conceivable animal and always of great quality. Perhaps my top Steiff felt toy would be the chicken skittles they made with wooden base. If you have other types of egg cosies, I'd love to hear about them.